The 2011 Missouri Lodge of Research annual meeting will be held Tuesday, September 26, 2011 at the Grand Lodge Communication at the Holiday Inn In Columbia at 3:00pm. 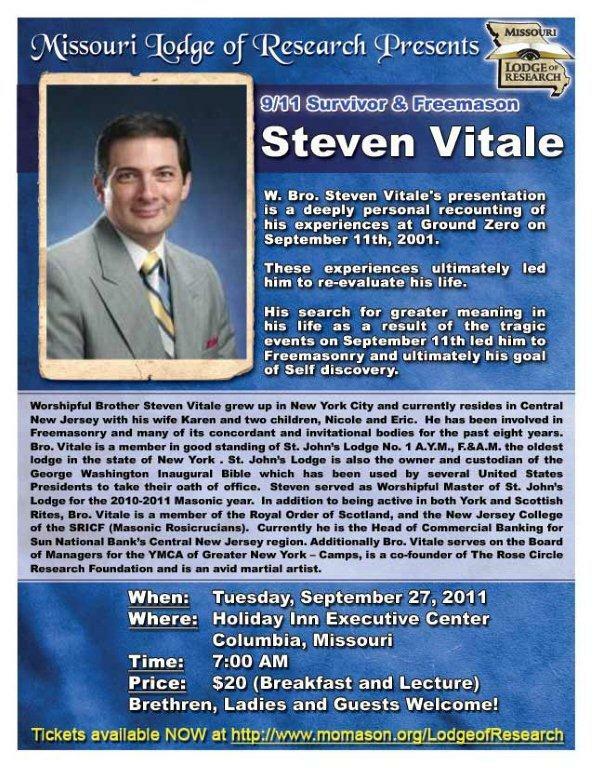 The annual breakfast will be on Wednesday morning September 27th, at 7:00am, continuing the Truman Lecture Series with a presentation from W:.B:.Steven Vitale, 9/11 Survivor & Freemason. Cost for the breakfast is $20.00. Bro. Vitale grew up in New York City and is currently living in Central New Jersey. He is a member and PM of St. John's Lodge No. 1 in New York. 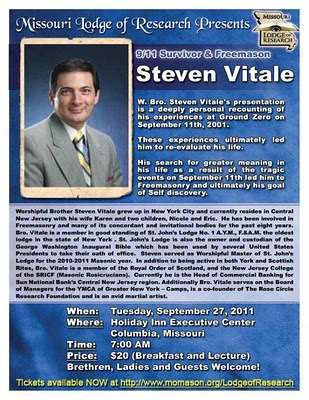 Steven's presentation is a personal account of his experiences at Ground Zero on September 11, 2001, experiences that led him to reevaluate his own life, become a Mason, and find a path to his own self-discovery.